As its name implies, this was intended to fit pre-war Austin 7’s which had a 750cc engine. It was initially built in two sizes to fit 6 ft 3in and 6ft 9in wheelbase chassis, but when Falcon Bodyshells was formed, that company took with it the rights to build the shorter wheelbase version and Ashley just manufactured the longer version. According to a price list dated 1 April 1958, it had a length of 11 ft 4 in and a weight of 85 lbs, though a lightweight racing version of 70 lbs was also available. The bodyshell cost £78 and the optional “Gran Turismo” hardtop an extra £25. By 1961 the 750 was virtually obsolete, there being no longer demand for it. This was built for wheelbases from 6ft 11in to 7ft 4in and was produced for a few months from early 1956 until Peter Pelladine left to form Falcon Shells and it became the Falcon Mark II. 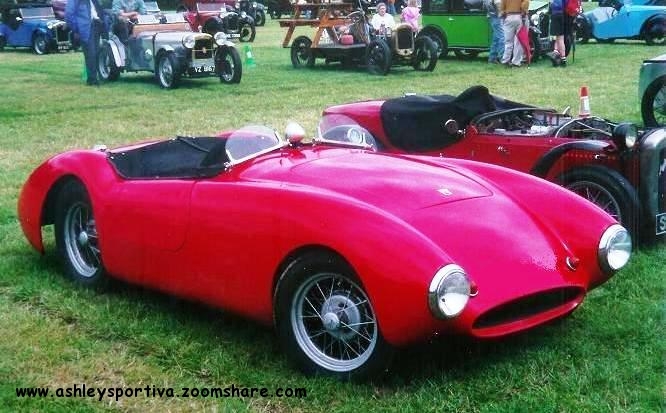 The body was primarily designed for track rather than everyday road use and could be mated to an Elva chassis. Thus a number of race cars at the time used it as the body for their cars. This was built for the Ford Anglia and Popular chassis and in 1960 was lengthened to fit the Ford E93A chassis, the 1938 to 53 Ford Prefect, thus making a four-seater version an option; the Anglia and Popular chassis being 7ft 6in long whereas the Prefect one was 7ft 10in, Ashley’s also offered its own chassis to be used with this body. Possible engines included the Ford sidevalve from the Prefect (which was 1172cc – hence the car’s name), Ford 100E and 105E, BMC A-series and MGA engines. There were options of open or closed bodywork. There was no hood available for the Roadster version, so it was completely open, not a convertible. The coupe version used the same shell as the open one, but a roof was added. In theory, this could be removed, but the top was held on by many bolts and fitting or removing them was a two-man job so in practice customers would be unlikely to do this. Side window panels were only available as an optional extra, so without these it could be quite cold inside! When side panels were ordered, these were extremely difficult to install and most owners who bought them eventually brought the car back to have them fitted. 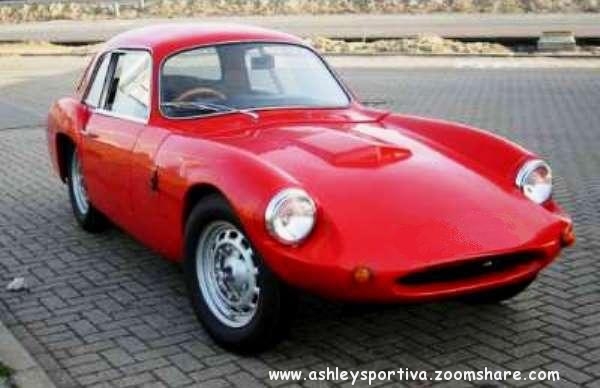 The closed bodywork versions were frequently referred to as the Ashley GT. One advanced feature of the body was the double-skinned doors. (Early versions also had a windup window system). A special “U” fixing was incorporated within the fibreglass body, so no door hinges were visible. The coupe version of the car was “about £160” and the roadster versions were “available complete for £105. In fact this is the price for the bodyshell and the price for the coupe version was exactly £160. Production lasted from 1958-61. 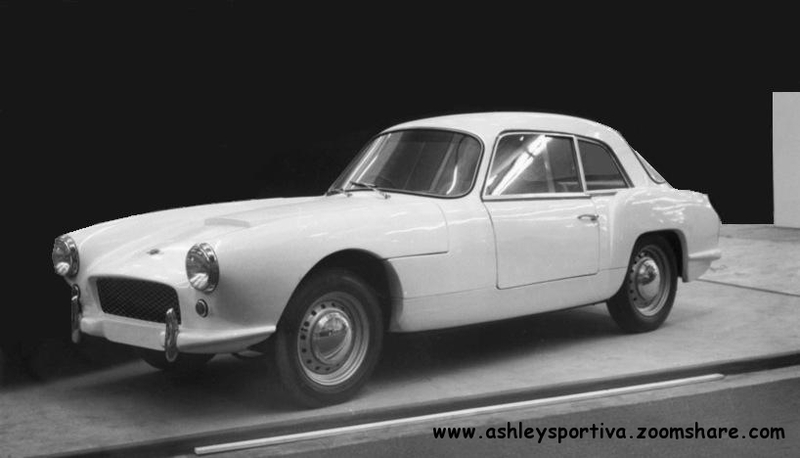 The Sportiva was available as a bodyshell or with an “Ashley” chassis. Notes courtesy of "The History of Ashley Laminates"
Photo's courtesy of various internet sites.